SAILING: The promising weather at Kata Beach only got better on Day Two of the 2012 Phuket King's Cup Regatta, with strong winds delivering some great sailing for the fleet while being a little too strong for some others. While the sailors enjoyed the conditions, the jury were a little less happy working long into the night to handle a raft of protests in response to a finish-line issue. The final results for the second race of the day are awaiting confirmation, pending the resolution of several protests under scrutiny by the International Jury. In IRC Zero class, the president of the regatta organising committee and owner of Wan Marang set about the business of consolidating Monday's performance with another win in race four. His boat, skippered by Jaray Tipsuk, managed to secure a two-second win on corrected time ahead of Frank Pong’s 76-foot Jelik. Reliable winds helped the team to achieve the superb result, as they have been practising intensely in wind speeds just below those experienced on the water on Tuesday. Frank Pong’s Jelik team got their revenge in race five, a "round-the-islands" course, securing victory over the Sansiri-sponsored Katsu, skippered by Ben Copley. This IRC Zero class competition is shaping up to be one of the closest ever. In IRC1, Steve Manning guided his Walawala 2 team to victory in race four and five, building on the strong performance his crew enjoyed last year, while David Fuller’s Ichi Ban team could only manage second place in race four today. 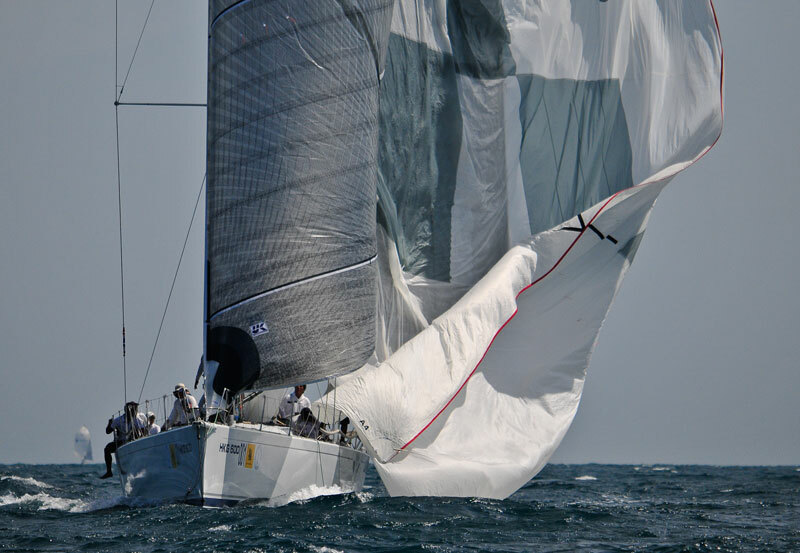 This class remains unpredictable, with at least five boats in contention to take honours at the end of the week. The second race on Tuesday for IRC2 remains in the protest room, but Matt Allen’s Ichi Ban team (one of two Ichi Ban teams competing in the 2012 Regatta) took the honours in race four. No problems in the Firefly 850 Sports class with both race results in-the-bag. Some fast-paced action saw Hans Rahmann’s Voodoo team notch up two more victories to lead the class by on seven points, ahead of Dyer Straits in second overall and Advanced Racing Team third in the standings. The Multihull class introduced a new winner in race four, with Timothy Robins skippering Nipper. Fantasia had to settle for second, finishing some way behind the victorious Nipper team on corrected time. Andrew Stransky still has his eye firmly on the title, making for an intense battle over the remaining race days. Race five remains in the protest room. In Platu One Design class, the team on Tuay Lek, skippered by Scott Duncanson scored the win in race four ahead of the other three all-Japanese entries in the class. Protests for race five will be heard by the Jury tomorrow. Richard Dobbs and his Phuket King’s Cup Regatta-winning Titania of Cowes romped away with the win in the first race of the Premier class today with another terrific performance. The team is really reaffirming its dominance, and could well be in for back-to-back Regatta wins. Results of the second race today remains in the Jury room. Kirill Sakhattzev’s Sail Plane team was victorious again leading a huge pack in the Bareboat Charter class, placing first in race three ahead of Russian compatriot Mikhail Beloborodov on Tinicola 2. In the Cruising class, Linda, skippered by Jack Cristensen took their first win of the series while William Lo and his crew on No Name took first in race three. Points for consistency today go to the Sansiri-sponsored all-Thai team Ok-La. Windsurfing honours went to Hong Kong Olympian Chun Leung Michael Cheng again today in both races, ahead of Thailand’s Natthaphong Phonoppharat who finished second and third. Cheng is dominating the table, having won three of the first four races.